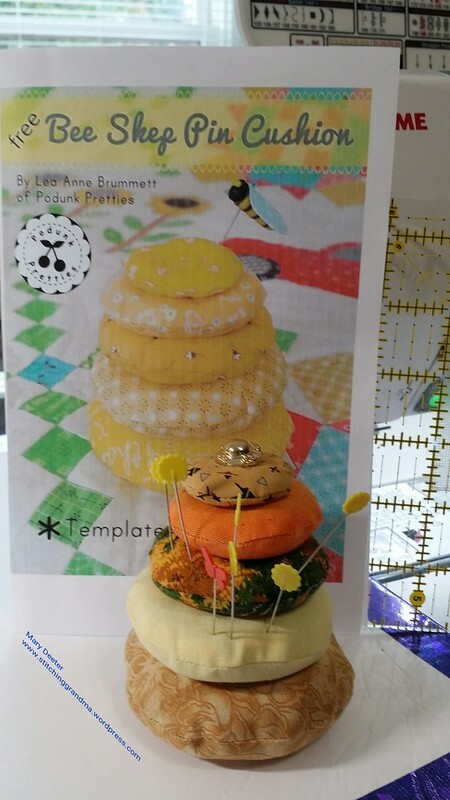 Bee Skep Pin Cushion FUN !! 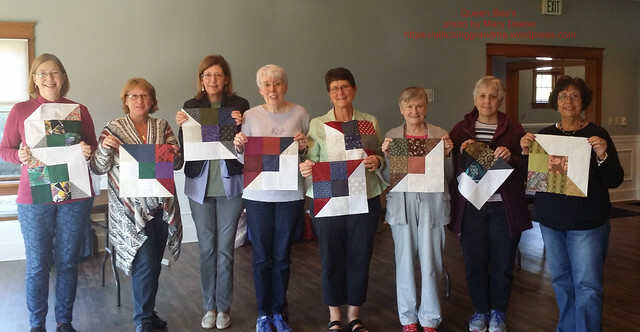 A friend of mine sent me a link to the cutest pin cushion pattern she had come across, and thought that it would be a great project for the members of the Queen Bee’s quilt bee. As the bee leader, she thought that I could entice the members into making something quite cute and fun. The pattern is by Lea Anne Brummett , on a blog called Podunk Pretties – https://podunkpretties.blogspot.com/2018/07/bee-skep-pin-cushion.html . 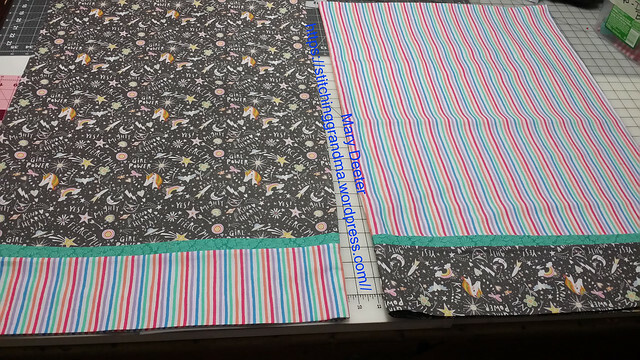 If you want the pattern, go to Lea Anne Brummett’s blog, and at the bottom of the page is a link to the whole pattern. The link will take you to her CRAFTSY store. This is a free pattern! 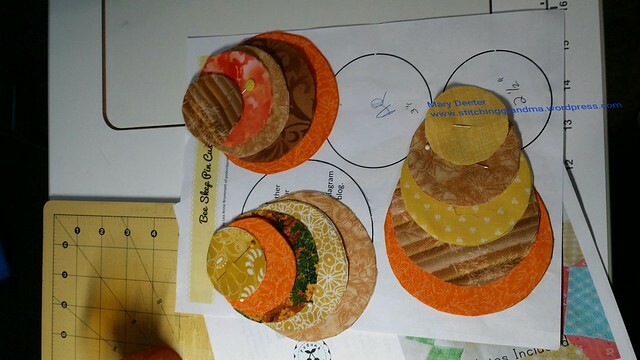 Once I got my pattern printed out, I debated about cutting those circles. 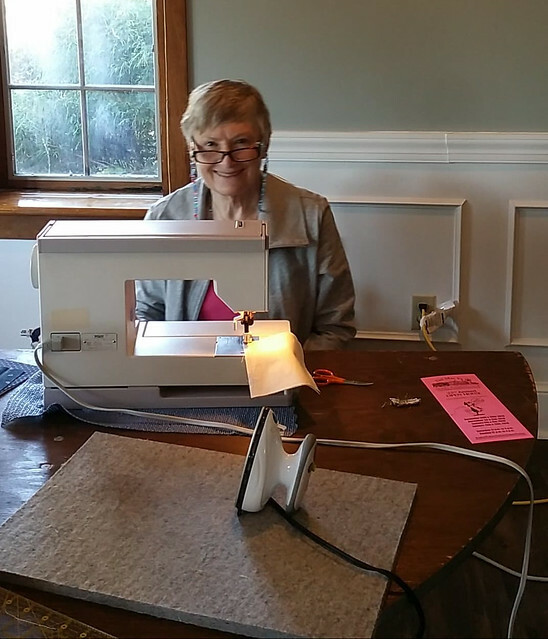 I messaged another guild member who has an accu-quilt dye cutting machine. She had 2, 3, and 5″ circles. I needed more sizes than that. So, I bit the bullet, got out some carbon paper, and traced over the circles onto a manilla file folder. I cut those circles out and marked them with the sizes. 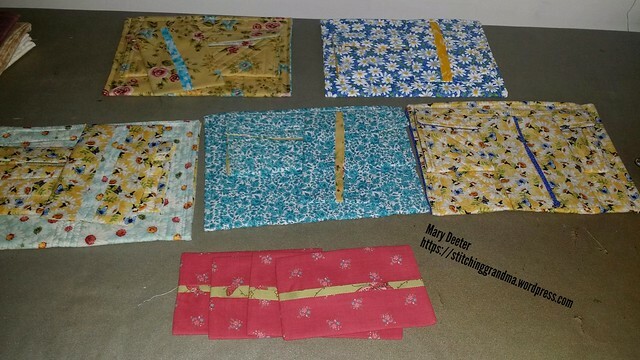 Before long, I had 12 sets cut out, one for each member of my Queen Bees Quilt Bee. I played around with the circles, and arranged them in pleasing groups and bagged them up. Then, it was time to sew my Bea Skep!! In no time at all, I had all 5 layers of the pin cushion stitched, clipped, turned and stuffed. Took me longer to hand stitch all of them closed after they were stuffed! I put ground English walnut shells in the largest circle to give weight to the Bee Skep. The rest were filled with poly batting that I shredded into fine pieces as I stuffed. I decided to use a metal shank button on the top instead of a yellow flat button. I like the dimension it gives. I made 2 or 3 extra passes through the bottom cushion with my needle to make sure the knot doesn’t pull out. 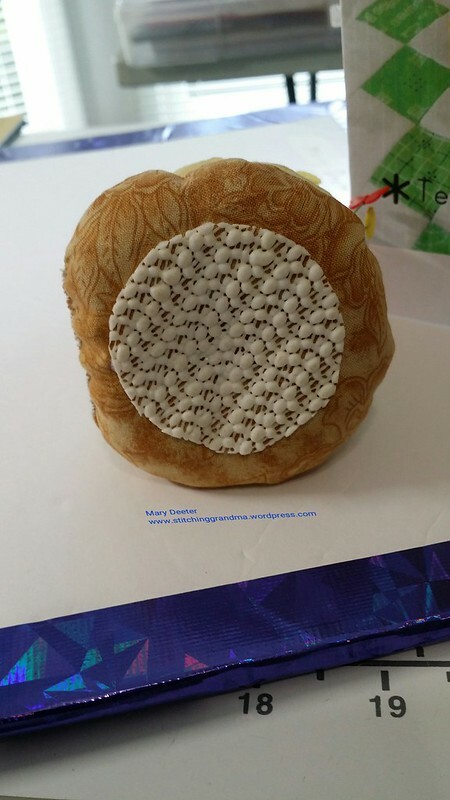 When I finished, I glued a circle of rubber shelf liner to the bottom of the pin cushion. I used that thick Elmers craft glue, and made sure I had good coverage on the rubber shelf liner. 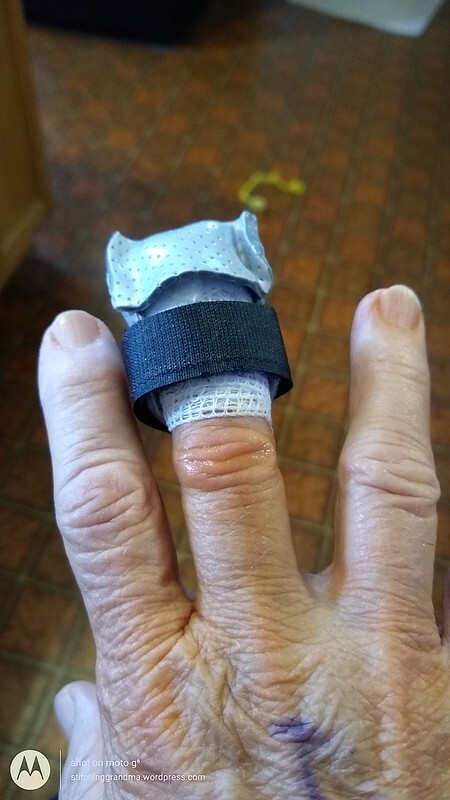 I used a plastic sandwich bag over my hand to press on the rubber circle to make sure it stuck well. I let it rest on it’s side for a few minutes to dry, and made sure to only set it on the plastic bag until I was certain the glue was dry and would not stick to my table etc. I like the way it turned out. It is only about 3.5″ tall. Looks cute with my flower headed pins and butterfly pin in it. (I don’t have any of those fancy pins that Lea Anne has….yet….) It stands about 3 1/2 inches tall. 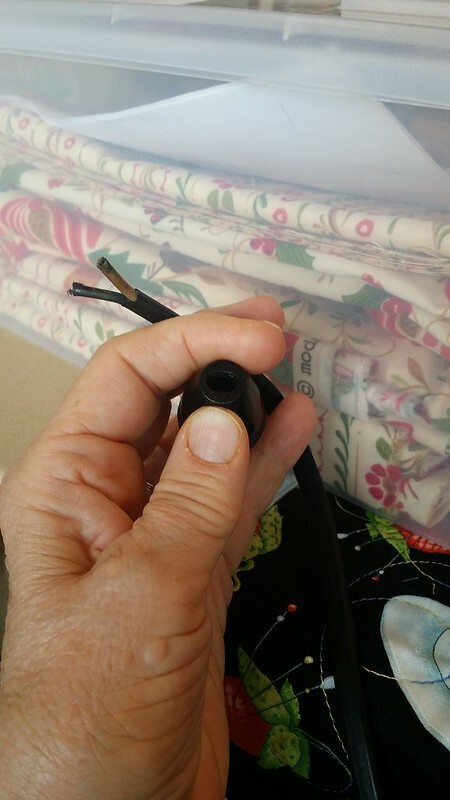 Take away – I would use a different needle next time when I am doing the stitching with the crochet thread. The needle I used was too big to pass thru the holes in a standard button, and I wanted to put a flat button on the bottom to give extra security to the threads on the bottom. Since the needle was too broad, I made those extra stitches. Check the needle size through the holes in the buttons before you get started! Cost – $0 — everything came from stash, scraps, the button box and items already on hand like crushed walnut shells, pieces of poly bat (from an old pillow), and crochet thread. Thanks Lea Anne for the free pattern! This is a fun fast project. 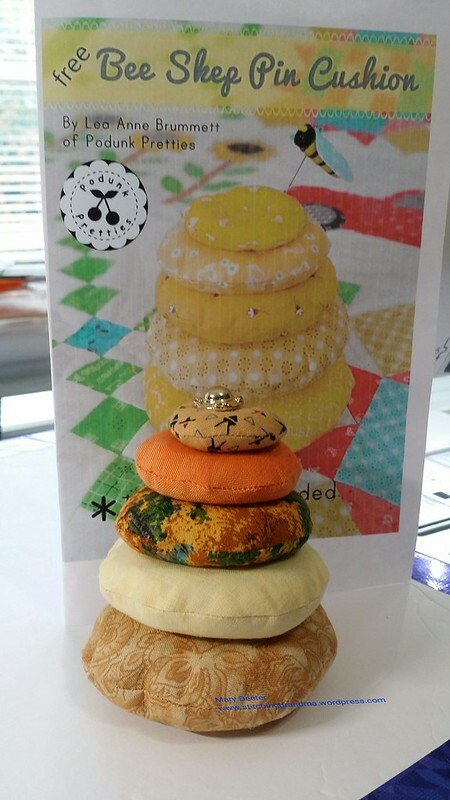 I hope you go to the blog “Podunk Pretties” and download your free pattern and make this cute Bee Skep pin cushion. After I finished my own set, I decided to add some bits to the kits I am gifting to my Bee buddies. I opened up the sets I made for my Queen Bees and added 2 buttons, and a round circle of shelf gripper, and a length of yellow crochet thread. Then I bagged up some ground English walnut shells for each of them to use in the bottom round or 2 of the cushion. They can use either poly bat or wool in the top sections. I will take an extra bag of metal shank and flat buttons with me to the next Queen Bee gathering and they can select any additional buttons for their own projects. All they need to do is download the pattern and start sewing! 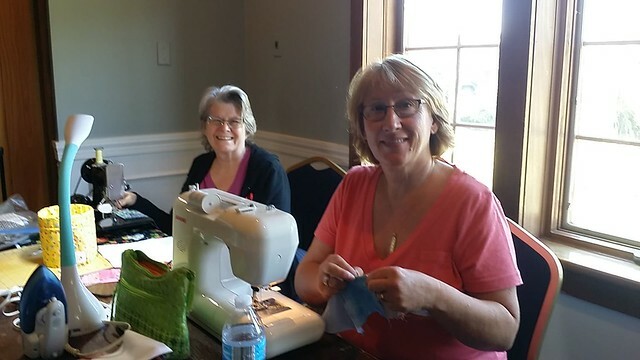 Thanks LeeAnne of Podunk Pretties for the great fun, free project. And thanks to my friend Pat for sharing the link to Lee Anne’s blog. I had fun with this fast and easy project. 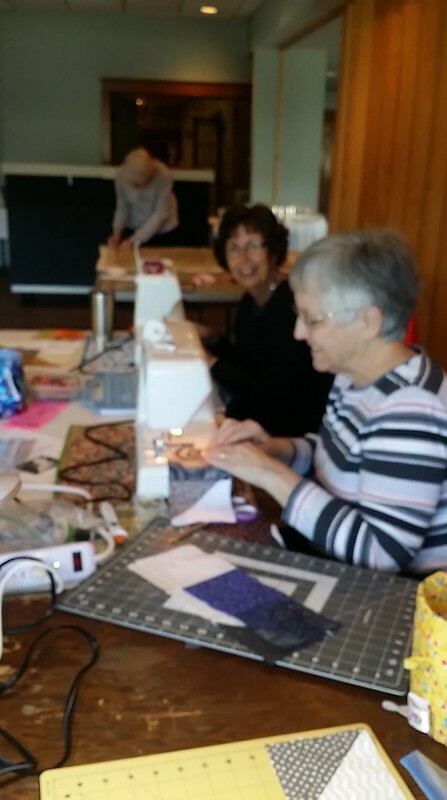 Have you found a quick and easy project that is worth sharing? 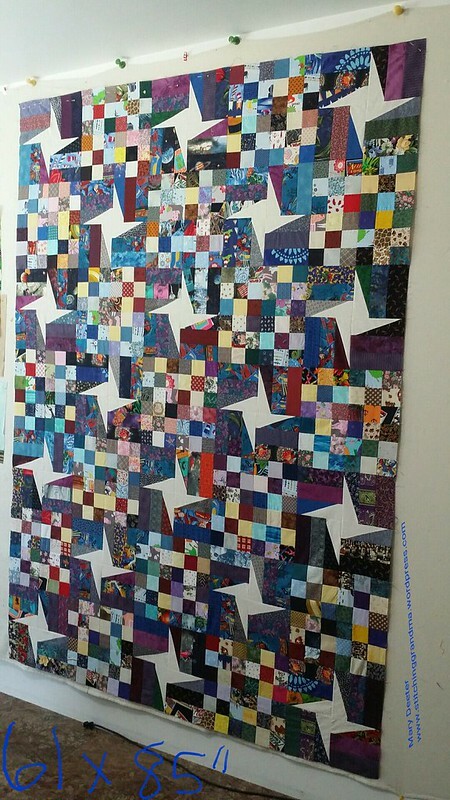 Yes, I sometimes talk about my own quilts on this blog…. 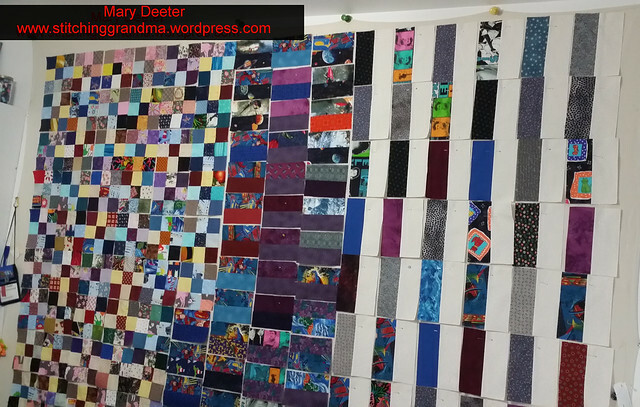 Yesterday I posted about a quilt show I visited. Today, I am changing directions. 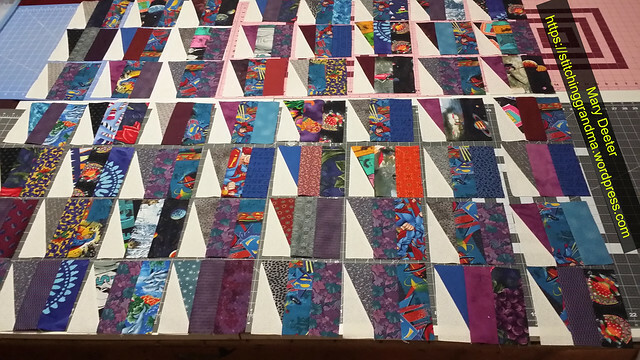 I’ve been playing along with the mystery quilt shared by Carole – http://frommycarolinahome.com// and earlier in June she published the finally pattern layout. The pattern is currently free on her blog until the end of June, when she will pull it down for commercial publication. I really enjoy Carole’s patterns, and I especially like her mysteries. One of her rules is not to try to “guess the layout” before the final pattern setting is given. Her other rule is to not share the specifics of the pattern, but to ask people to find it on her page. 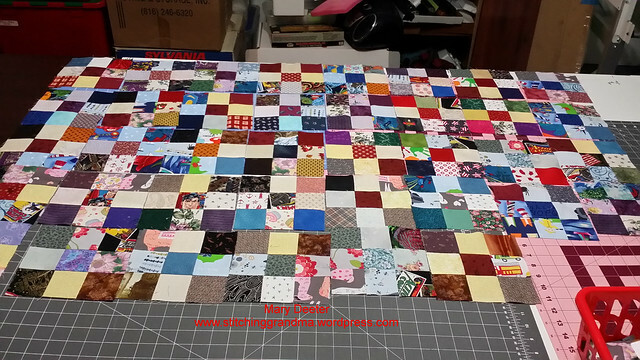 If you are following my blog using a computer, you should see a button off to the side for the Scrap Dance Square Dance Mystery quilt. If you want the pattern for free you must hurry! A quick recap -Each step of the dance had a fun name associated with the activity. I posted about each step as it was occuring, but I will share a photo from each month. If you want more info, you can do a quick search for “Scrap Dance Square Dance” on my blog to read all the posts. January the yardage requirements and cutting instructions came out. It was called “Bow to Your Partner, Bow to Your Corner” . ALL my fabric except the background fabric came from my scrap baskets! 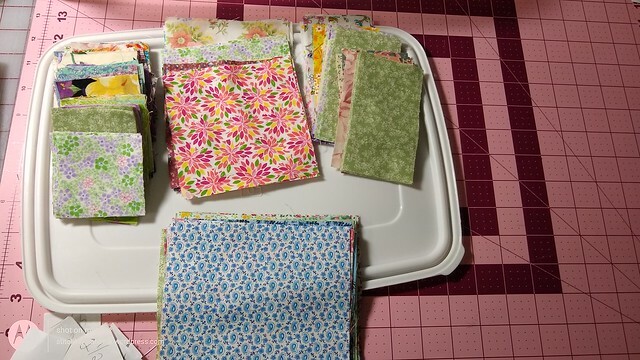 I decided that I could easily make a twin with all the scraps I have collected, so I got busy during my scrap clean up setting aside bigger pieces for the rectangles. I knew I had enough squares of the required size in my scrap storage system, so I didn’t cut any squares. 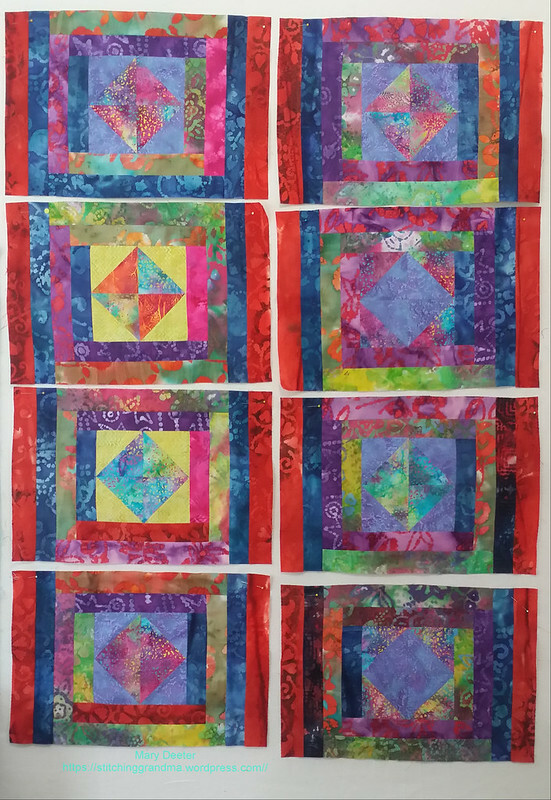 February we made 9 patches – and the lesson was called “Do-Si-Do”. March had us working with our rectangle pieces of 2 different sizes and she called that “Come Down the Middle”. In the photo below you can see ALL my pieces up on my design wall. April was working with our rotary cutters and it was called “Allemande Left”. You can see the result in the May photo where we made those nice triangular cuts of color and white. May was again working with our rectangle pieces and she called that step “Promenade”. In April, Carole gave us “unfinished sizes”. The sizes she gave were “without borders”. I must have glossed over those dimensions. Once on my design wall, I thought it was too narrow and too short for MY typical twin. I decided, I wanted to go larger…..of course! I added an extra row of blocks all the way around to bump the size up to 61×85. I didn’t want to add borders as much as I wanted the star to be complete all the way around. 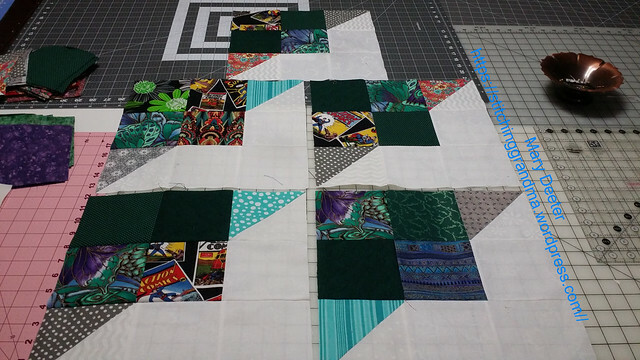 So, before I could finish the assembly I dug back in the scrap boxes and tried to find scraps that were similar in tone and color to what I had already included in the quilt so it wouldn’t be to obvious that I added those blocks “at the end” of the assembly. I was pretty happy with the color placement and the final outcome. I loved the spinning stars. This has been a great project and as always, a lot of fun to follow along each month. My method has been to “set aside the clue day” if possible and dedicate it to working just on the mystery project. It seems to work out well for me except when travel or other commitments get in the way. Carole gives such good clear instructions her patterns are easy to follow. If you like what you see you have a chance to download the pattern for free before the end of June. On my blog, I have talked about many of the other projects I have made using Carole’s patterns. 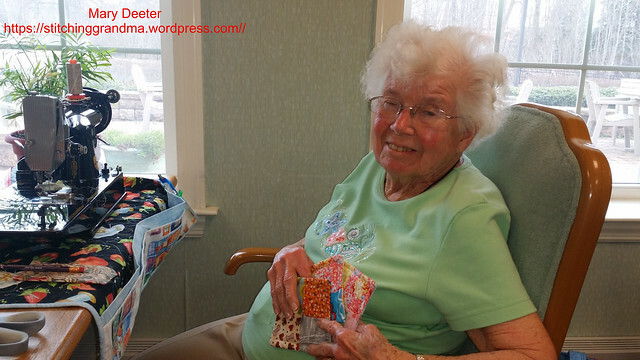 She has free patterns on her blog as well as some for sale. Go take a look and enjoy the fun. I will be linking up to “Oh Scrap” when the link up comes on line and I will post that link here. early next week.